Jim Garrison: "Where indeed and the Secret Service. And the F.B.I." The first print citation I can find claiming a last minute change in the motorcade route appears in Jim Garrison's 1988 book On the Trail of the Assassins. However, both the Tuesday, November 19th Dallas Morning News and Dallas Times Herald report that the parade would travel on Main to Houston to Elm. Therefore the last minute change, mentioned at least four times by Garrison, is nothing more than a fabrication on his part. So if there was no last minute change in the motorcade route, what does one make of the statements by Plumlee and Files? In Plumlee's November 21, 2004 personal statement, which appears at http://www.jfkchat.com/plumlee1.html, he indicates the assassination attempt was to take place in the vicinity of the Adolphus Hotel at Main and Akard, which is one-half mile east of Dealey Plaza. However, Plumlee adds, there was a sudden shift in plans when the "routing of the motorcade had been changed at the last minute to Dealey Plaza." [Emphasis mine] In my opinion, this is rather far-fetched. Plumlee needs to provide evidence that there really was another planned parade route. 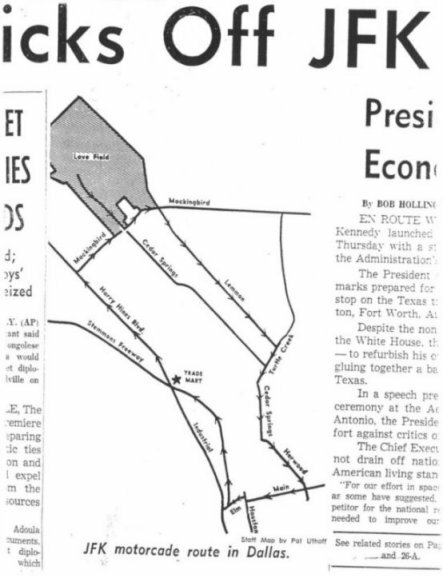 A route that, contrary to published reports, would not take the President through Dealey Plaza. The difficulty he would have with the Adolphus Hotel theory is that the hotel is nestled between Main and Commerce Streets, where the only westbound traffic toward Dealey Plaza was Main Street. Commerce was, and still is, a one-way street going east, so the motorcade could not have traveled west on Commerce to get to the Trade Mart. In theory, the motorcade could have driven on Elm Street, which is still a one-way street heading west. But if that had happened, the motorcade would have passed a block north - and out of view - of the Adolphus, thereby removing it from being a possible location for the assassination. In the case of Files, he claims to have learned about the motorcade route change from Rosselli who got the information from Ruby. But since there was no last minute change - Files' story becomes a fabrication built upon a historical falsehood. In the end, Files, Plumlee and Garrison would have us believe everyone involved in the protection of the president and those who would successfully make the attempt on his life never bothered to check the route as published in the local newspapers a full three days before the event. I can only conclude that at some point after 1988 Plumlee and Files read or heard through others about Garrison's unfounded claim. Neither realized the allegation was fictitious and both attempted to weave that last minute change myth into their self-professed activities that day. 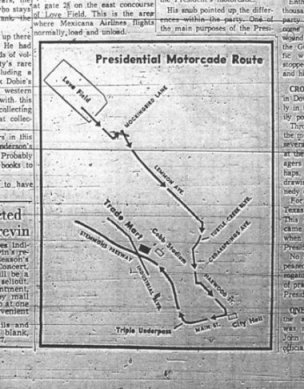 Maybe all were fooled by the erroneous map of the motorcade route published on the front page of the Friday Dallas Morning News. Unlike the map printed in the Dallas Times Herald the Dallas Morning News had omitted the right turn from Main to Houston and the left onto Elm.